Seals were used to sign documents in an age when almost everyone was illiterate. This one dates from the late 12th - early 13th centuries and is made of a pewter alloy. 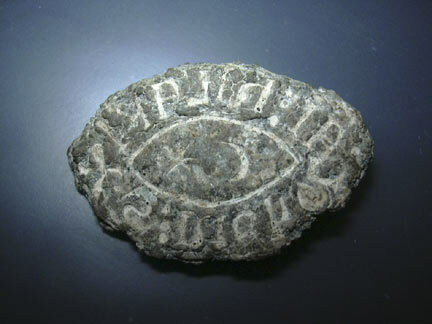 The reversed inscription around the edge, which is in 'Lombardic' script, reads: (from 8 o'clock, reading counter-clockwise) S (this is the seal of) NICHOL (Nicholas) FI(L) (the son of) HILARI (Hilary). Originally there was a loop on the back from which it could be hung from a cord, but this has broken - perhaps the reason it was lost in the first place. While it's tempting to think that Nicholas could be traced, in fact only those who did something really good, or really bad, were recorded. Everyone else just...faded away. 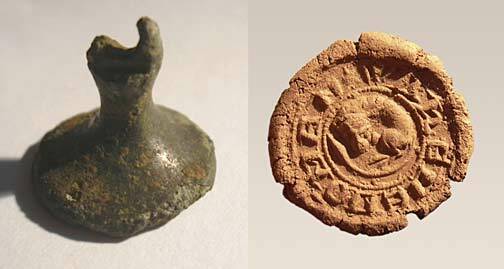 A second, and somewhat later, 'upright' medieval seal. This one is bronze, and has a lovely little curled-up dragon in its centre. I have not yet deciphered the script around the edge - watch this space!